The Evolve Back (formerly Orange County) Kabini campus has lots of trees, many of them fruit bearig ones, attracting lots of birds. 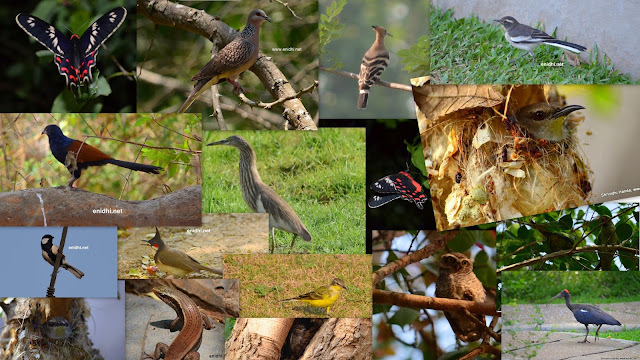 In this post, I am showcasing the birds I clicked inside the Evolve Back Kabini campus and around its periphery. I enjoyed clicking these pictures, hope you like them. Few of them are cropped for closer look. There is a sunbird nest infront of the main building, next to departure lounge. Despite regular human movement, this bird has chosen this place to build its nest. Spotted it several times during my 3 day stay- it would fly away if I go any closer. But on 3rd day, it didn't fly away and allowed me to take good closeup photos. When I kept the door open for a few minutes, two sparrows entered the room. They flew out after sensing my presence. Sparrows can be seen in restaurant and all over. 7. Spotted Owlet- Spotted using naturalist of Orange County, Mr. Kishen during early morning nature walk, on a tree some 300 meters from the Orange County Campus. Without his sharp eyes I wouldn't have spotted them. Above are the 17 types of birds I could spot and click inside and around the Orange County Campus. Birds clicked near the Kabini river and during Forest Safari are not shown here, will be covered in a separate post. There were many other birds that I couldn't manage to click well. Also 2 more common birds- crows and pigeons I didn't click. Other than the birds, below animals and insects also were of interest. Update: Thanks to Siluvai Amalan for helping me identify/correct names of many of the birds above. 6. Common Rose Butterflies- spotted during night trail. These butterflies were resting hanging from a tree, hence didn't run away. Spotted more fauna and flora during night trail- including snails, ants, lizards, toads, frogs and a water snake, but didn't take photos due to low lighting. Evolve Back Kabini is also planning a butterfly garden which is not ready yet. Overall, I was happy clicking all the life I could see in the campus. Wow! There are so many of them. Number 15 is a type of Bulbul I guess! Very nice captures, loved all , specially loved the "sun bird in its nest". Such a wide variety of flora and fauna. Really enjoyed the post. Have a great day! 25 things to do at Evolve Back Resorts Kabini!